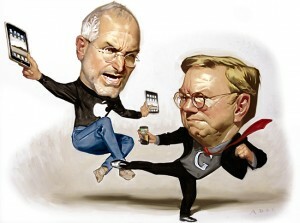 The rivalry between Apple and Google is nothing new. They clash heads over many different aspects of their businesses but essentially it is to do with protecting and expanding their market share of mobile devices (read: Apple’s iOS and Google’s Android OS). So, any way they can attack each other over who owns what piece of software is fair game. Today, Apple have been given the go-ahead by an US appeals court to pursue Motorola Mobility (which has been taken over by Google) in claims surrounding the use of touch screen technology. The case was originally dismissed in 2012 partly due to lack of evidence but the appeals court has decided that the earlier judge was wrong, and it can now proceed, along with counter-claims of patent infringement by Motorola Mobility. The original judge, Judge Posner, had said that an injunction from Apple on Motorola Mobility preventing it from using it’s technology would be detrimental for consumers, and instead, recommended that Apple license the technology to Motorola Mobility. Since the appeal was first announced Google had announced it was selling the Motorola handset to a third party business amid speculation that they were trying to protect their interests by offloading the proverbial tire from around the neck of the company. However, it is rumored that they would still hold on to several patents. This latest legal wrangle comes just days after Apple was in court over other patent disputes with Samsung. Depending on which side of the fence you sit on and where you take your information from, you may believe that Apple is stifling competition, abusing it’s power and trying to hold consumers to ransom by defending it’s claims to patents, or you may agree that Apple has invested vast amounts of time and money into developing new technologies and so should quite rightly defend these to the end. Part of the technology sector life. You’d be forgiven for rolling your eyes at the latest news of a new patent battle between these technology giants and you wouldn’t be alone. However, what many of us see as nit-picking and petty squabbles of tiny details, can ultimately translate and extrapolate into the long term survival of a company and billions of dollars, so as long as there is innovation and a market for it, patent-related court cases will be the backdrop to it. Cooking up a Big Share of the Apple Pie… Have You Got a Bad Apple?